Most of the defects affecting heat-treated wood quality are often attributed to heterogeneous heat transfers in industrial kilns. 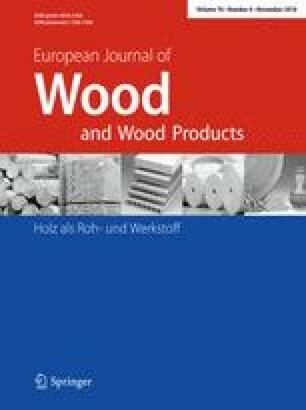 Even if interspecific variability of wood has been reported to affect thermal degradation of the material, little has been reported on the effects of intraspecific variability. The aim of this work was to study the effect of intraspecific variability of silver fir (Abies alba Mill.) wood on its thermal degradation. For this purpose, wood samples were sampled along the radius of cross-sections to estimate the effect of radial position on wood thermal degradation. Sampling was carried out on discs of four trees, two resulting from dynamic growth stand and two from standard growth stand. The study was performed at different scales: at wood compartments scale involving juvenile and mature heartwood, transition zone between heartwood and sapwood and sapwood as well as at intra-ring scale. Wood samples were ground to sawdust and subjected to thermogravimetric analysis and chemical analysis. Juvenile heartwood was shown to be more sensitive to thermal degradation than other compartments. The thermal behavior of sapwood was not particularly different from that of heartwood, and the presence of extractives did not influence significantly thermal degradation. Earlywood was more sensitive to thermal degradation than latewood explaining the higher susceptibility of fast growing heartwood containing larger rings with higher contents of earlywood. The authors gratefully acknowledge the Région Lorraine and Lab of Excellence ARBRE for PhD grant of the first author. LERMAB and SILVA are supported by a grant overseen by the French National Research Agency (ANR) as part of the “Investissements d’Avenir” program (ANR-11-LABX-0002-01, Lab of Excellence ARBRE) and General Council of Lorraine. Authors warmly thank Pierre Gelhaye for management of sampling and the ONF RDI department “Pôle de Dole” (Dole) leaded by Bruno Chopard who puts at disposal the experimental design and helped in felling and logging the trees.